Among all the Martian outflow channels, Ravi Vallis is about the shortest, yet it displays all the features found in larger and longer ones. Ravi runs about 200 kilometers (125 miles) long, cutting across the flat terrain of Xanthe Terra, between Ganges Chasma and Chryse Planitia. To its north lies a much longer channel, Shalbatana Vallis, whose origin scientists say may be linked with Ravi's. 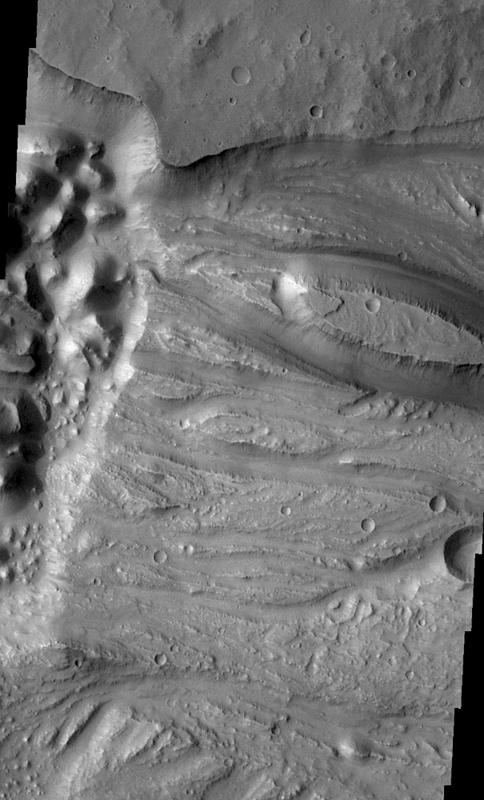 The outflow channel begins at the eastern end of Aromatum Chaos, a 90-km long depression. From there Ravi runs generally northeast as a scoured channel and ends abruptly as it drops off into an extension of Hydraotes Chaos. Along the valley's course lie two smaller areas, Iamuna and Oxia, that share (in reduced scale) the same features found in Aromatum and which characterize all chaos regions. Mars scientists interpret chaos regions as places where groundwater has broken out and undermined the surface, loosening the rocky material and washing it away. When the water stops flowing, what's left behind is a messy jumble of hummocks, hills, and mesas that all looks — well, chaotic. The big questions that arise regarding this and other chaos regions are: when did it occur? How much water? For how long? And what triggered the flow? Using the number of craters identified here and in the surroundings, scientists place the age of Aromatum and Ravi in the Hesperian Era, the middle period of Martian geologic history. It lasted from 3.7 to roughly 3.0 billion years ago. Answering the other questions call for closer looks at the Aromatum/Ravi system. The image above is a mosaic of infrared frames taken in late afternoon by the Thermal Emission Imaging System (THEMIS), a multiband visible and infrared camera on NASA's Mars Odyssey orbiter. Cooler areas appear dark while warmer ones (those facing the Sun most directly) appear bright. The smallest details THEMIS can see at infrared wavelengths are 100 meters (330 feet) wide. Aromatum Chaos, the bowl where Ravi Vallis was born, is a depression about 90 km (56 mi) long by 30 km (20 mi) wide, and which reaches bottom at a depth of 3,500 meters (11,500 ft) below the Xanthe plateau. On average, however, Aromatum is about 1,500 m (4,900 ft) deep. Littering the floor of Aromatum are hills and bumps that stand as much as 1,000 meters (3,300 feet) high. As the closeup at right shows, these are generally rounded in profile, although close to the walls some hills and ridges still keep the jagged look of broken-off chunks of plateau. Scientists theorize that chaos regions form when underground water, held in place by a layer of ice, breaks out in some way and pours out across the landscape. The Martian surface is cold now and has been for billions of years. A frozen subsurface, called the cryosphere, lies everywhere on Mars, though its depth and thickness vary over the globe. So what cracked open the cryosphere here? Aromatum's somewhat angular outline may provide a clue. A team of geologists led by Harald Leask at Britain's Lancaster University proposes that volcanic dikes and sills intruded into Xanthe Terra, perhaps driven by the activity in Tharsis. Dikes are thin, largely vertical sheets of lava that force themselves into geologic faults and cracks; a dike that intrudes horizontally is called a sill. The heat from these could melt the ice that kept groundwater trapped below the surface thus releasing it, and the location of the lava sheets would control what areas melted and which did not. Aromatum's outline may be controlled by the forces that created linear features throughout this part of Xanthe, including Shalbatana Vallis nearby. Whatever the trigger was, the resulting flow was impressive. The area seen at left lies at the east end of Aromatum and marks where Ravi Vallis proper begins. This is a ramp — where the ground rises by about 1,500 meters (4,600 ft) from the bottom of Aromatum to a level that lies about 1,000 meters (3,300 ft) below the top of the Xanthe plateau. From here, over the remaining 200 km (130 mi) of Ravi's course, the valley descends about 300 meters (1,000 ft) before dropping over an edge into Hydraotes. The deep scour marks — which rise uphil in the direction of the downstream flow — give evidence of the flood's speed, which the Lancaster University team estimates ranged as high as 90 km/hour (50 mph). The flow's depth ranged from 50 to 150 meters (150 to 460 ft). The scientists also estimate that the flood was a single outburst event lasting 2 to 10 weeks. The edges of the Ravi channel show terraces caused by erosion when the waters were highest. Then as the flow slackened, the water narrowed and separated into a few individual channels that carved deeper grooves. The flat, roughly circular area in the center — see the closeup at right — is likely the location of a tiny chaos area, just 2.5 km across. It must have contributed some water to the flow, then it was filled with channel-bottom sediments. Finally, only a single small bump was left to stick above the flat, sediment-covered surface. 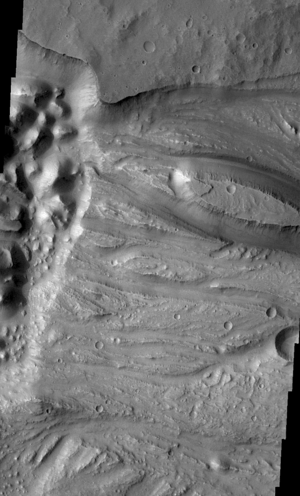 Oxia Chaos, seen at left, lies amid the channel of Ravi Vallis. It is 27 km (17 mi) across and averages about 1,000 m (3,300 ft) deep. Only part of Oxia however resembles a standard-issue chaos region, the upstream half probably had its hills and mesas swept away by the floods. What caused chaos to erupt at Oxia? Scientists hypothesize that erosion in the channel bed likely removed enough overlying material that was keeping the groundwater penned up. If this material happened to be especially thin here, then scouring into the valley bed could be enough to trigger an outburst. 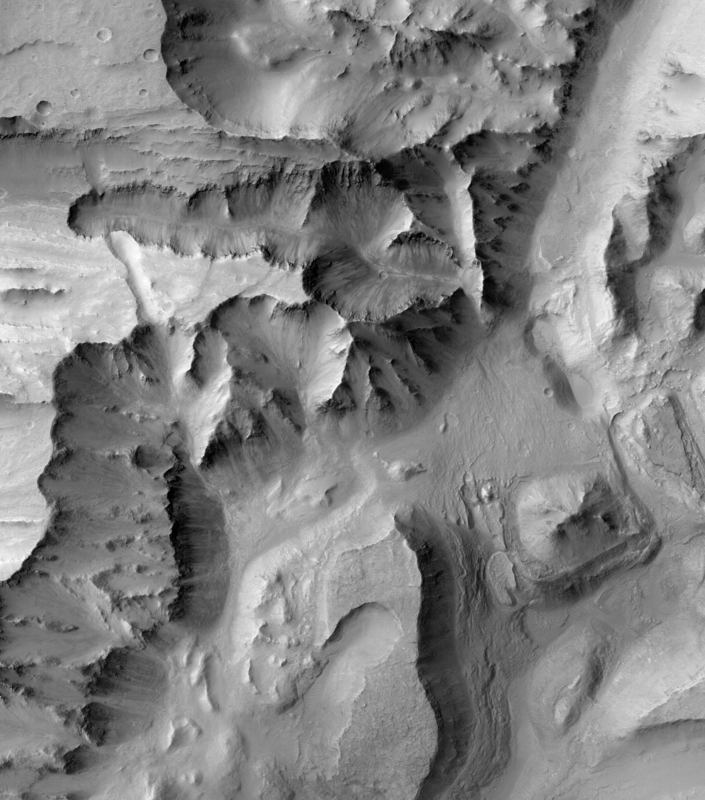 The closeup image at right shows streamlined mesas and deep gouges cut into the channel bed by the flood — likely augmented by the eruption of water from Oxia itself. The downstream end of Ravi Vallis is, if anything, more dramatic than its beginning. Extending west from Hydraotes Chaos is an "annex" that is equally chaotic. Ravi's channel dashes across the top of the Xanthe Terra plateau — and then abruptly drops more than 3,000 meters (10,000 ft) into a chaotic lowland. Did Ravi Vallis once extend farther to the east? Perhaps. But if so, there's no sign of it in the rubble that lies at the foot of the slope. Which poses a puzzle, because the natural feature usually found at the end of a fluvial valley is a delta built from all the debris washed down the channel. The journey's-end seen here has no recognizable delta, at least nothing like those seen elsewhere, such as in Holden and Eberswalde craters. Instead of a delta, the Xanthe plateau has a deeply notched edge. One possibility is that Ravi's floods did build a delta, but it was destroyed when the chaotic regions to the east collapsed. Or perhaps the delta was destroyed by the last of the Ravi floods, which appear to have left a small streambed deposit down the center of the groove (see closeup at right). That much water is far too much to have come solely from the empty depression that is now Aromatum Chaos. That hole could contain only about 4,100 cubic km — and naturally most of that was rock, with water contributing less than 10 percent. So where did all the necessary additional water come from? Scientists point to Ganges Chasma. There, they think, was a possible source for a large-scale aquifer underlying the Xanthe region. If it existed, then that could feed enough water into both Ravi and Shalbatana Vallis to produce what we see today. Chaos on the floor of Aromatum — where the waters sprang from. But scientists say that even when brim-full, Aromatum is too small to hold enough water to carve Ravi Vallis. The waters had to be fed from an aquifer loaded with much more than this depression could contain. This scene, about 9 km (5 mi) wide, is part of image P03_002286_1788_XI_01S043W, taken by the CTX camera on the Mars Reconnaissance Orbiter. At the east end of Aromatum Chaos, the floor rises swiftly to become the bed of Ravi Vallis. Because the scouring runs up the slope, the water must have flowed fast and strong. This scene, 10 km (6 mi) wide, is part of THEMIS VIS image V05033001. Just downstream from Oxia Chaos (left edge of image), the bed of Ravi Vallis is eroded into deep grooves and streamlined island-mesas. The large mesa seen here stands 500 to 600 meters higher than the channels on its flanks. The scene, 18 km (11 mi) wide, is part of THEMIS VIS image V18486051. Ravi Vallis comes to an abrupt end at a sharp plateau edge. 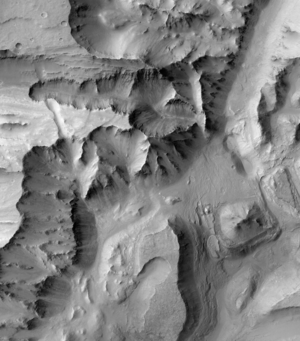 The canyon at top center appears to have been carved by the last stages of flow in the valley. But where's the delta that fluvial valleys usually build? This scene, about 22 km (14 mi) wide, is part of image P14_006690_1799_XN_00S038W, taken by the CTX camera on the Mars Reconnaissance Orbiter.